Ninja and Snake – together at last! 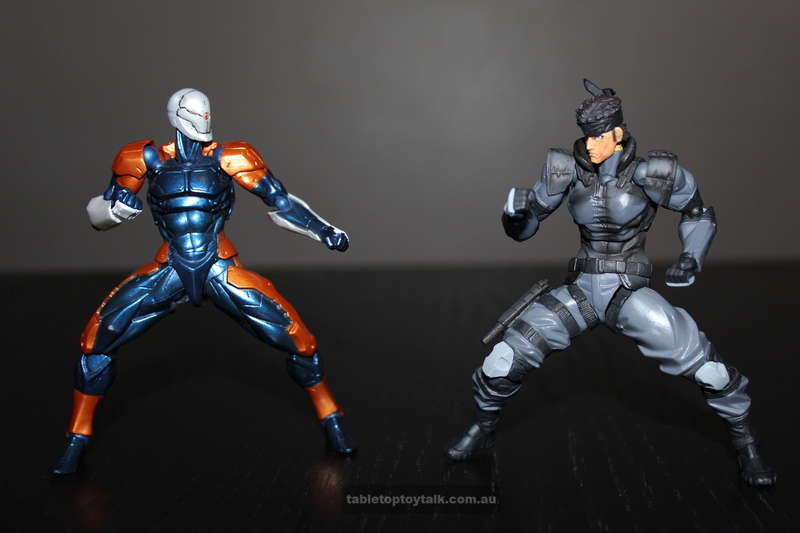 From the smash-hit PlayStation game “Metal Gear Solid” comes the Revol Mini versions of Solid Snake and Cyborg Ninja. I remember spending a lot of time playing “Metal Gear Solid” (in my younger days of course :P) and to finally have figures of these two is something that I’ve been eagerly anticipating, so on with the review! 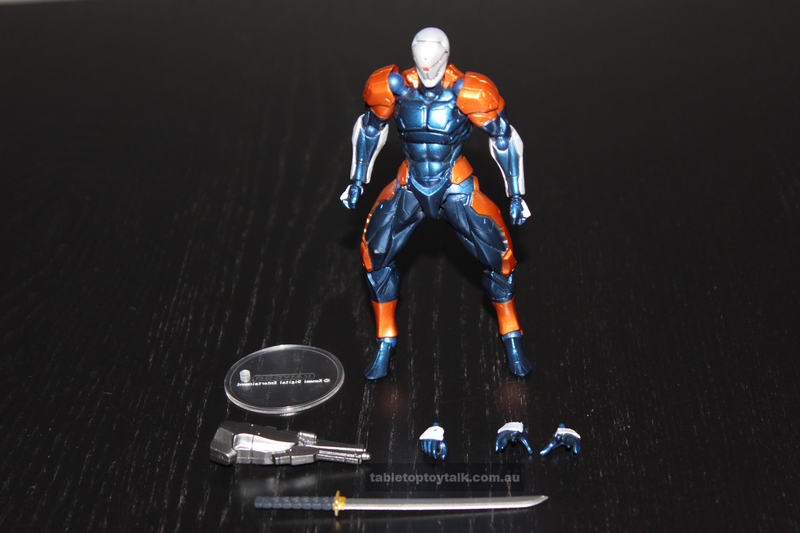 One of the first things that you may notice straight out of the box is that they’re fairly detailed for such small figures – roughly in scale with G.I. 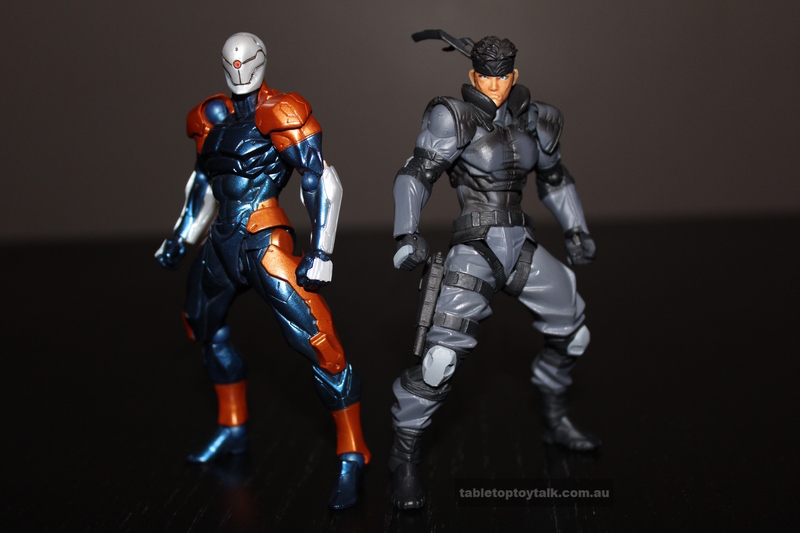 Joes, and their overall look feels more stylised. 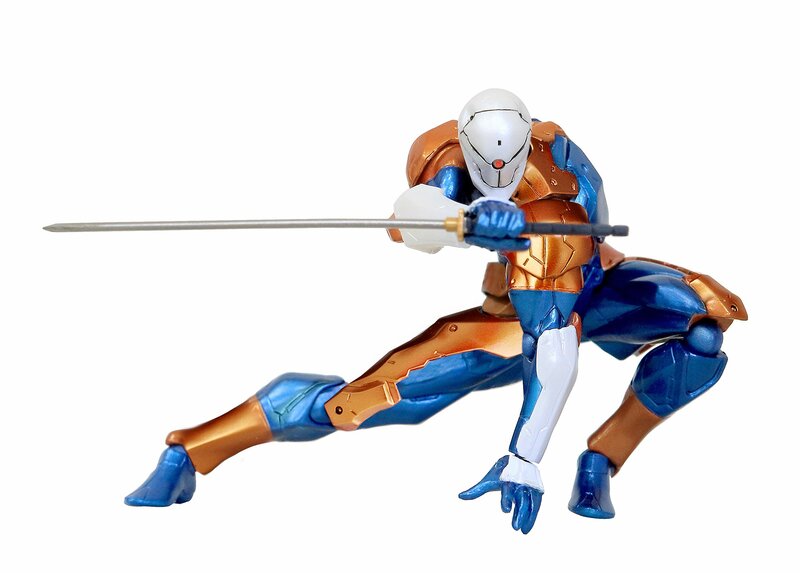 The joints move smoothly considering the Revol Mini line is an offshoot of Revoltech, whose figures feature joints that have a “ratchety”feel to them and click when moved. Both of them are able to hold poses very well and feel like figures you might like to have at your work desk and just pick up and play with and try all sorts of poses and scenes. 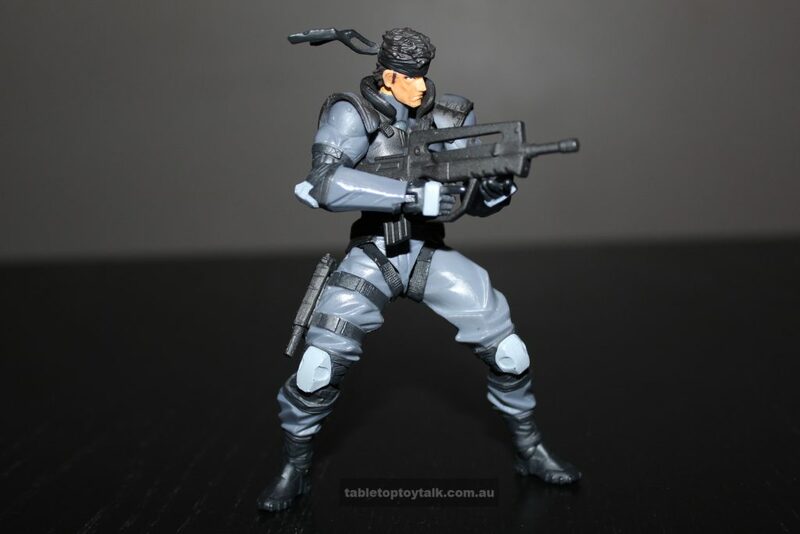 Featured in Snake’s package are his FAMAS assault rifle, his trusty SOCOM pistol with silencer (which can be removed), left and right closed fists, left and right hands for holding weapons, and an open left hand that’s able to hold his cigarette. 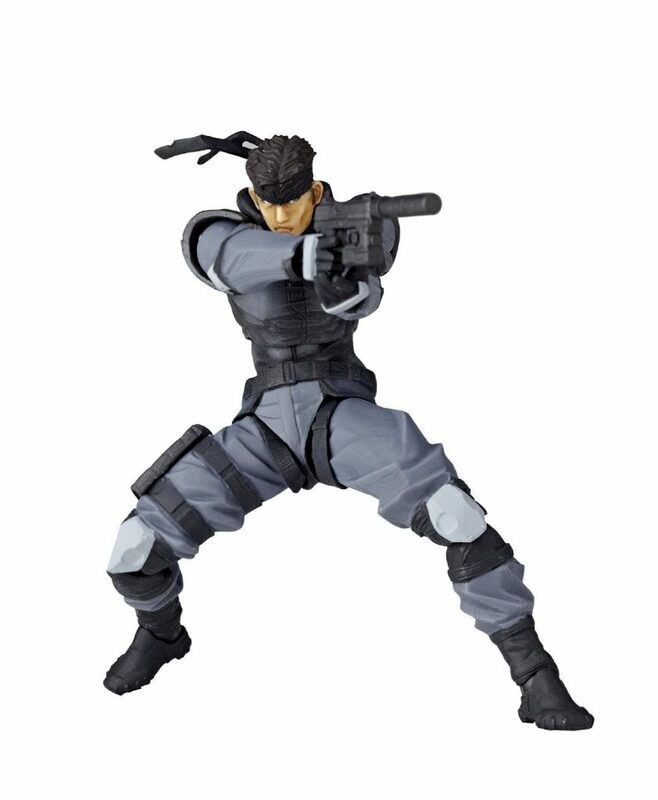 He also comes with binoculars, a claymore mine with trigger switch and cable, a clear disc to assist with standing, and a tool to adjust his eyes. It might not look like it at first but the eyes are actually adjustable. He can also equip Cyborg Ninja’s arm laser. 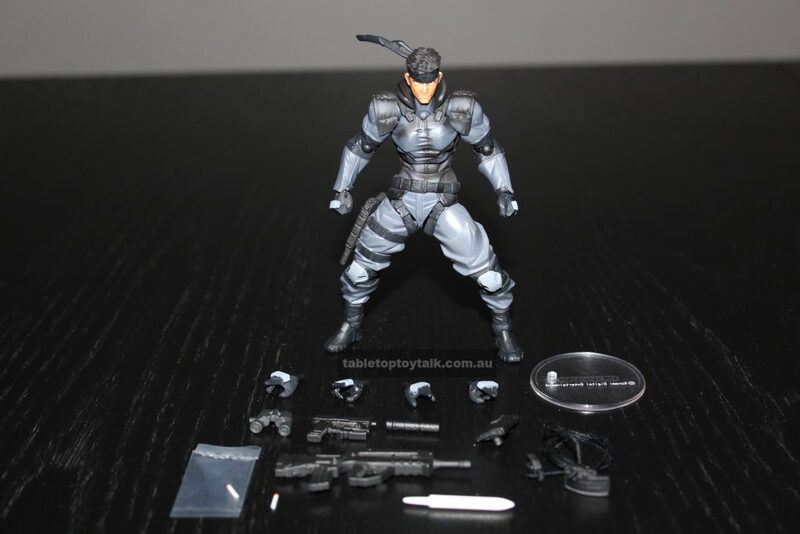 Featured in Cyborg Ninja’s package are his sword, left and right closed fists, left and right open hands, a gripping hand for his sword, a clear plastic disc for him to stand on, and a laser gun that slips over his forearm (once you remove his hand of course). They both have a reasonably large range of movement for such small figures, and are quite capable of replicating some of their more iconic poses. The joints at the shoulders, elbows, knees and ankles make posing effortless. 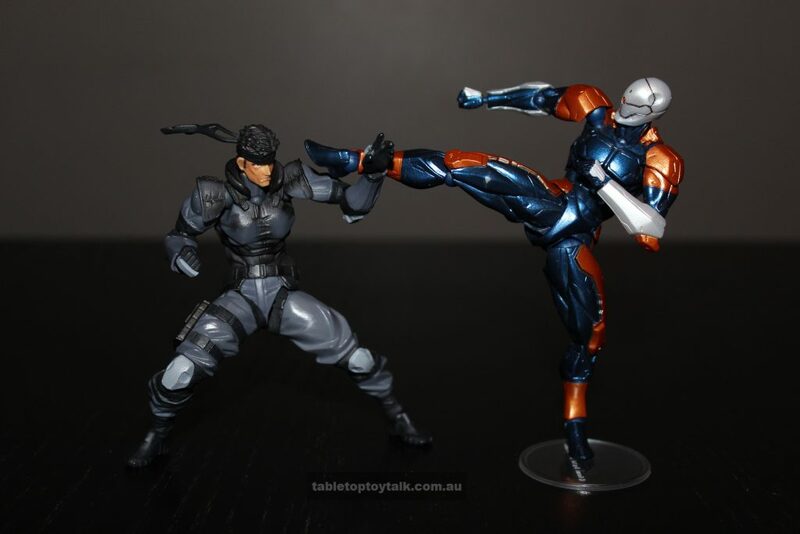 One issue you may encounter, however, is that while they are able to do some pretty dynamic posing, the way that their legs have been sculpted means that they are pretty much unable to stand in a neutral position with their legs together. In short – they’re bow-legged. The joints in the neck, torso and hips also have a good range of movement without seeming too exaggerated. 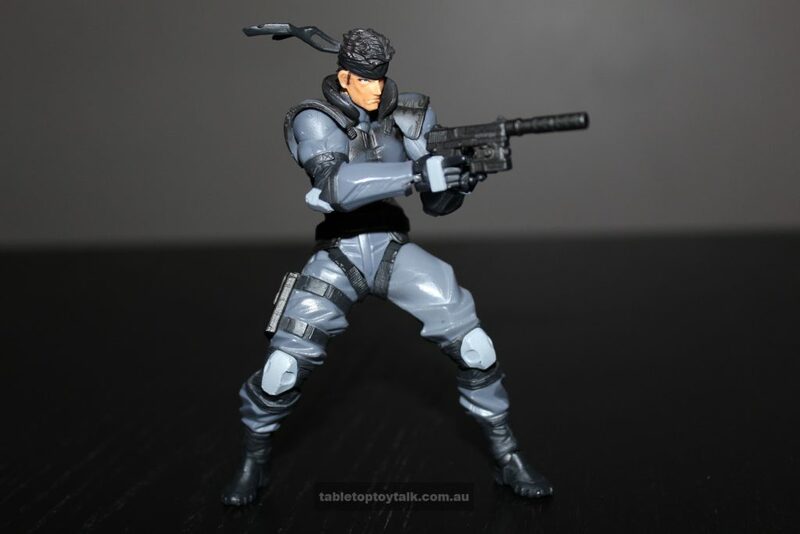 It’s really easy to make them as expressive as you want them to be, and with the added benefit of Snake’s adjustable eyes it helps to create even more possibilities. 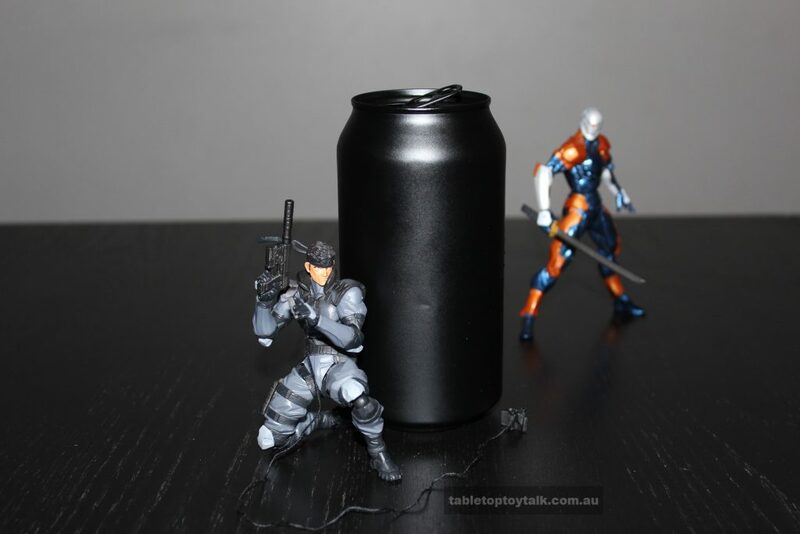 Solid Snake and Cyborg Ninja by Revol Mini will be a welcome addition to not only fans of Metal Gear Solid, but to anyone looking to own neat little figures of Snake and Ninja to have at their desk to pick up and play with at any time. 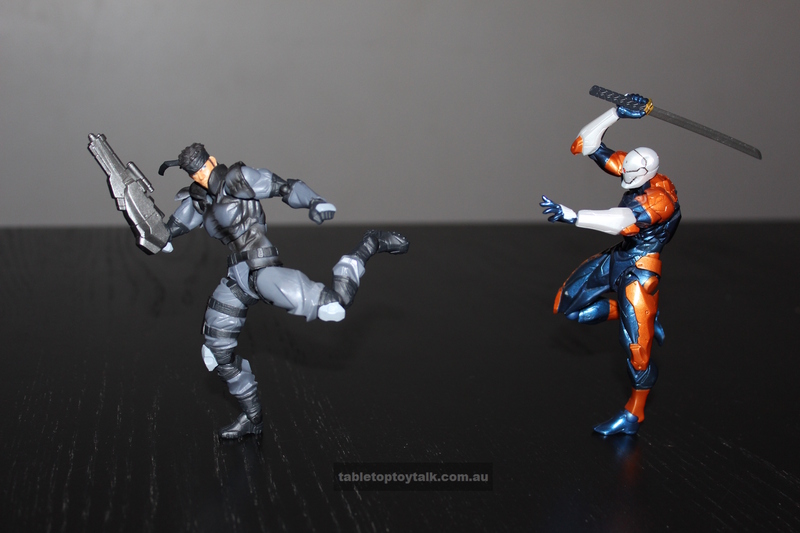 The joint system makes posing a joy and I’ve found myself having a lot of fun with these guys. 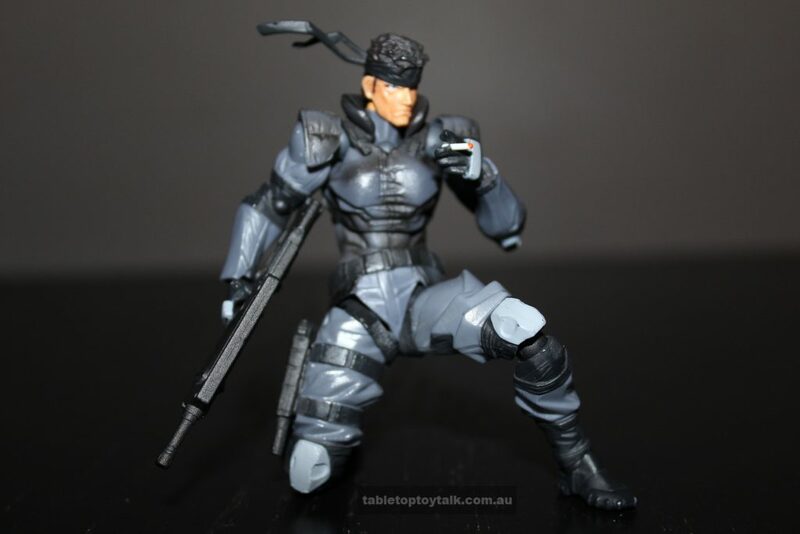 Extra care should be taken with Snake’s cigarette accessory (a spare was included with mine) as I can see it being lost very easily due to how small and fiddly it is. 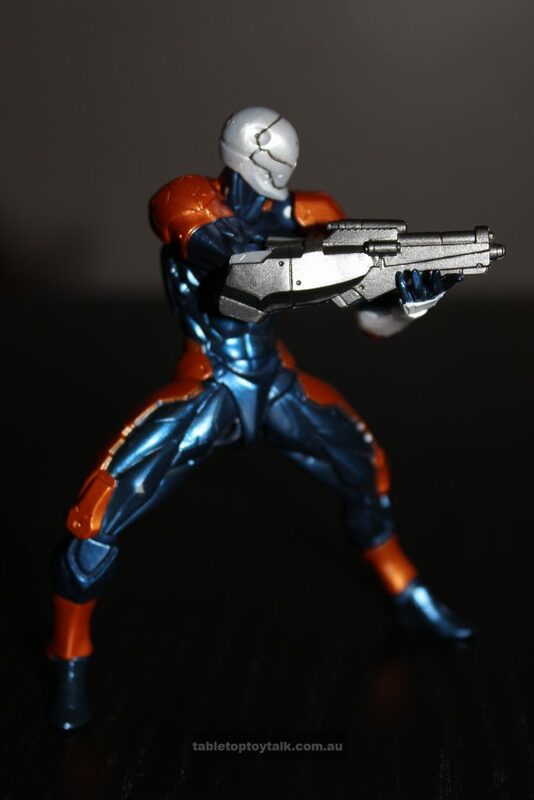 If you like, you can check them out at the links below, or other figures in the Revol Mini line. 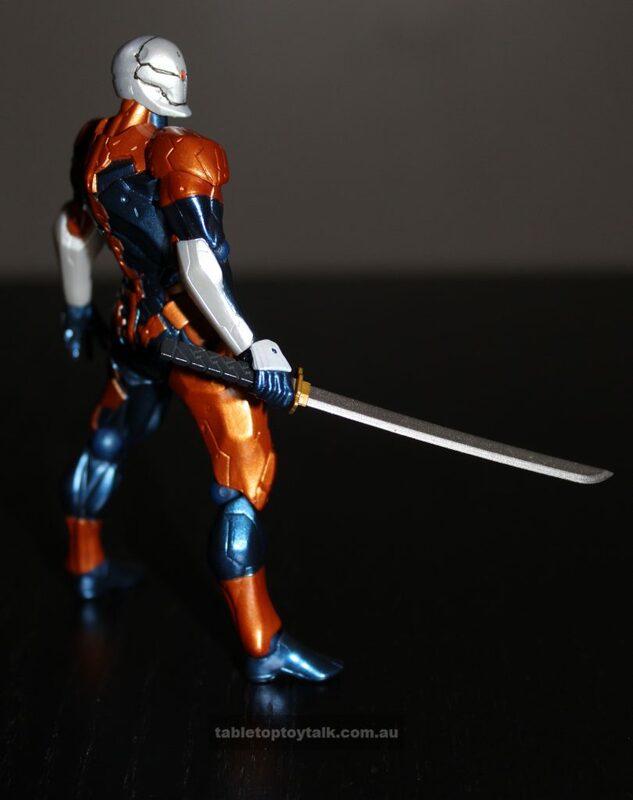 I like to write my own material, that way I can be as honest about the figures in my collection as I want to be.